Inside Orange Leaf's colorful surroundings - a great place for a book club, meeting, or just to gather with family or friends. Why is it that the coffee drinkers are the only ones who get to anticipate winter flavors like gingerbread, peppermint, cinnamon, and egg nog? No longer! Orange Leaf yogurt combines the chill of yogurt with the thrill of winter, and it is only a few miles from Castle Pines. Mike and Helen Ogbourne opened the first ever Orange Leaf in Colorado earlier this year with the purpose of bringing families and community together. Located in Parker, the friendly staff invites Castle Pines residents to come experience the uplifting and brightly-colored orange and green modern theme. Inside, patrons discover fun seating areas with seven sofas, a few high-top tables, low-top tables, chairs, and a patio outside to enjoy a treat. Sixteen flavors are served on any given day and a total of 65 flavors overall are available. There is also the option of swirling the flavors that are paired together for an added twist. A few favorites include cookie cake, red velvet, snicker doodle, spoonberry, wedding cake, brownie batter, cheesecake, and coconut. Orange Leaf offers both non-fat or low-fat flavors, and also have no-sugar-added, gluten free, and lactose-free flavors. 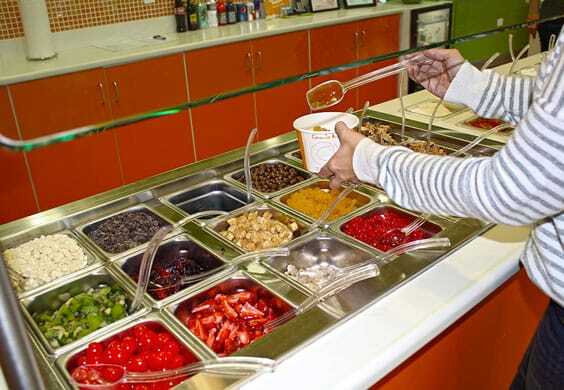 The best part is the selection of 42 toppings to choose from and a collection of syrups. Samples are available of all the flavors to make sure you get the flavor you are craving. Make sure you get the "Ounce Back" card. Patrons receive 10 percent back on every purchase. Orange Leaf also partners with local and surrounding schools, athletic teams, and other groups for fundraising from 2 p.m. - 6 p.m., Monday through Thursday. The school, team or families will promote the fundraiser and 15 percent of the sales during that time period will go back to the sponsoring organization. "It is a win-win for everyone," says owner Helen Ogbourne. "Families and friends have the opportunity to fellowship, the group raises money for its cause, and Orange Leaf gets to do what it does best ... serve great tasting yogurt," she said. Come and join for Orange Leaf happy hour daily from noon to 2 p.m. and receive 20 percent off. Active military, firefighters, and police officers receive a 15 percent discount all the time. Wear Broncos gear in during a game and receive a 25 percent discount as well. Bring in a report card and receive a free ounce of yogurt for every "A" earned. Principals or teachers can also get certificates to give to students from Orange Leaf for good grades or Super Duper Student Certificates for going above and beyond, good for up to eight ounces of free frozen yogurt. And, oh yeah, the holiday flavors ... gingerbread, peppermint, eggnog, and chocolate mint await. They cater, too. 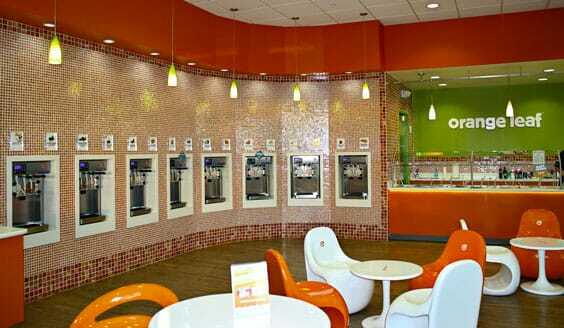 Orange Leaf is located at 11290 Twenty Mile Road, Parker. Hours are 11 a.m. to 9 p.m., Sunday through Thursday, and 11 a.m. to 10 p.m., Friday and Saturday. For more information, please call (303) 840-0066 or visit www.myorangeleaf.com. Don't forget the toppings; there are 42 to choose from.